During the past few years, the 2008 Clint Eastwood film Gran Torino has become a fond favourite. I enjoyed it very much when I first saw it during its initial release, and when I recently saw it again for the second and third time on DVD I enjoyed it even more. Like many good things in life, Gran Torino works well on several levels. First, it’s a great example of what Clint Eastwood does well as a director – he makes films that look simple and straight-forward on the surface yet contain a lot of rich depth underneath. Each time I’ve watched Gran Torino, I’ve found more details and nuances to appreciate. Second, it’s also a great example of what Clint Eastwood can accomplish as an actor. Walter Kowalski is one of my favourite performances of his, a wonderful depiction of a very grumpy old man who initially seems to be just that, but (like the film itself) turns out to be so much more. I’ll get back to Walt in a moment. Third, Gran Torino tells a hilarious, powerful and thought-provoking story about different types of people learning to live together and respect each other’s differences in age, culture and life experiences. As well, it has a lot to say about friendship and manliness. Which brings me back to Walt, the heart and soul of Gran Torino. When we first meet Walt, he doesn’t inspire much confidence or likability. Although it’s very sad that he’s recently lost his wife, and even allowing for how infuriating his children and grandchildren are, Walt seems aggressively bigoted, cranky, ornery and rude – and that’s even before he encounters the latest Hmong neighbours on his street. And for a while, cranky and mean Walt keeps on being cranky and mean Walt, especially towards his neighbours…but as the movie progresses, Walt comes to understand, appreciate and respect them. In turn, Walt’s new friends come to see that behind his gruff facade, he has many good qualities and strengths. When I first saw Gran Torino way back in early 2008, it had been six months since I’d begun the medication and therapy that to this day continues to change my life for the better. During those first six months I’d already made some very important gains, especially with self-confidence and feeling much better about myself. By the time I first saw Gran Torino, I had been thinking a lot about one of life’s most challenging and interesting concepts, “What is a man?” – and after seeing Walt in action, I had a lot more food for thought. No, that didn’t mean that I now wanted to yell abuse at everyone and snarl at them at gunpoint to get off of my property…but there were several qualities about Walt that have reinforced what I’ve learnt during the past few years about what makes a good man. First, Walt always took action. Whether it was someone breaking into his garage, seeing someone trapped by overwhelming odds, confronting violence on his front lawn or going to his friends’ defence despite great danger, Walt did something about it. He may have been afraid doing so – although I got the impression that he never was 🙂 – but even if he had been, Walt didn’t show it and he acted regardless. Second, Walt was a good role model. His relationship with Thao was one of my favourite components of Gran Torino. Although their first encounters weren’t very promising, because of faults they both had, Walt came to understand and appreciate his young friend and imparted vital knowledge that in turn helped Thao to grow and improve. Two of my favourite moments in Gran Torino are at Martin’s Barber Shop where Walt and Martin hilariously teach Thao about ‘guy-talk’, and in the next scene at the construction-site office where Thao demonstrates that he’s a fast learner. Third, Walt was a devoted and loyal friend. Although his reaction to the Hmong gang’s assault on Thao would have unfortunate consequences, Walt took action – and unasked – because he wanted to help a friend. Later, when Walt made his ultimate decision about what to do about the gang, he took steps to ensure that Thao would stay out of danger. Fourth, beneath that very ornery exterior, Walt had a charming soft side. I always enjoyed his moments with his dog Daisy whenever he confided to her, and I also liked the small barbecue he hosted where he joked with Thao, Thao’s mother and sister, and the young woman whom Thao had finally gotten the courage to ask on a date (with thanks to Walt). Finally, despite great loss and disappointment with some aspects of his life, Walt still took great pride in what else he had achieved – like his well-maintained home; the great collection of tools in his garage that he’d acquired over the years; and his Gran Torino that he’d even helped to build at the Ford plant. One of my favourite Daisy scenes was when he was sitting with her on his front porch just after he’d washed the car, and admiring its beauty and his handiwork – for me, it was a great moment about enjoying one of life’s simplest pleasures. 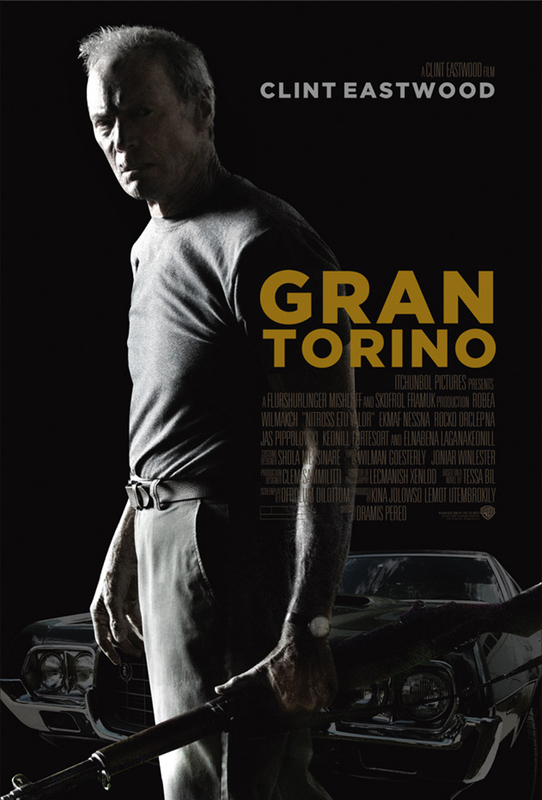 There is a lot more I could write about Gran Torino, but I won’t – because if you haven’t already seen it, the best thing is to do so as soon as possible.